More recently, it is often said that scaling up happens quasi automatically or at least with much less effort when the interventions of a project are ‘systemic’. This can happen in economic development projects by actors copying new business models or when new business models in a specific market also benefit connected markets in a positive way. In the Making Markets Work for the Poor (M4P) literature, these phenomena are called breadth and depth of crowding in, respectively. At the same time, the M4P literature acknowledges that crowding in might only in particular cases happen by itself and needs further efforts by the projects, such as for example dissemination of information about the new and successful implementation of business models. It is then anticipated that companies learn about the successes of their peers and will try to imitate them and with that the change will proliferate through the system. Again, it is often stressed that this will only happen if the introduced changes are ‘systemic’. But what does systemic mean in this regard? There are three important aspects at play here. In systems theory, every system is seen to have a purpose. The purpose of market systems, for example, is to create wealth. Consequently, it can be argued that interventions are then systemic, when they enable the system to follow its purpose more efficiently and effectively. A second aspect is quite basically the capability of the system actors to implement the change by themselves. This means that if changes are heavily supported by a project in order to overcome lacks in capacity of the actors, then these changes will most likely not spread through the system without the continuous support of the project. From an economic perspective, this means that the company or companies supported by the project are put in a privileged position and the hurdle for competitors to reach this position is simply too high. Hence, the project introduced a market failure instead of improving the market’s effectiveness to achieve its purpose. Institutions that support market actors play a big role here. Last but not least, in order for change to quickly proliferate through a system, it also has to be built on the same value system (I use the term ‘value system’ here, being aware it as a property of rather than a separate system to the economic or market system a project intervenes). Hence the introduced change has to resonate with the values of the system. If the values underlying the intervention are not compatible with the values of the people who need to implement the change, it will not be taken up easily or quickly. If change, for example, is built on a different view on the relationship between men and women, this might effectively hinder the intervention to reach scale in the desired time frame. Besides gender, other value related issues include human rights or environmental protection. There are, of course, other aspects that determine how change proliferates through as system. There might be different value systems that interact or feedback loops that are hindering the system to reach its purpose and instead profit a small number of actors. But for the time being I want to focus on these three. The notion of time is important. The three mentioned aspects can be overcome through time, either by a shift of purpose in the system over time, by the system itself through figuring out how to overcome the newly introduced market failure, or by changing values in the system. All this needs time, usually much more time than the lifetime of one project. This means that if we want to see quick change, our intended change needs to be in line with the purpose of the system, take capacities and capabilities of the system in account, and be built on the values of the system. Often economic development projects do not have a problem with the first, the purpose, as they also have the goal to produce wealth and through that reduce poverty. Also the question of the capacities of the actors has been taken up by economic development practice, for example by the M4P approach that puts the capacities of the market actors in the center of the intervention design, together with incentives – although the capacities of the relevant institutions is often still not taken into account to a sufficient degree. Where projects in my experience struggle most of the times is the question of values. To take the example of gender. Besides reducing poverty, donors are committed to promote gender equality. This means that most economic development projects follow a donor driven (or top-down) value on gender equality and women economic empowerment that in many countries contrasts with the local value system. In most cases, this leads to the situation where the projects might be successful to implement pilots where women and men profit to a similar extent because of the strong presence of project staff to promote these values, but struggle or fail outright to bring these changes to scale. In some cases, though, projects succeed to reach scale because they resonate with the local value system, for example by promoting products that are traditionally seen as income source for women and where women are allowed to keep the money they earn. This is not to argue that economic development projects and gender equality should not be combined or that changes in gender relations cannot be achieved by economic development projects. On the contrary, I think that poverty or well-being include aspects of gender equality and other human rights. The point I want to make here is that we have to be aware that such combined projects might take much more time to come to scale or might even have to be accompanied by interventions that target the local value systems. If we want to achieve quick economic growth, we have to align our projects to the values of the system. Many current projects still try to achieve both, quick economic growth for poverty reduction and improvements in gender relationships. This approach is not systemic and consequently prone to fail to reach scale or even significant impact in the pilot region. From a complexity point of view, there needs to be a co-evolution of the economic and the social systems, the latter including the value system. They have to grow together in a way to complement each other. This will lead to local solutions for both economic problems and social problems. If we are trying to promote solutions that are based on the co-evolution of our western/northern systems of economy and society, they are prone to fail in the context of developing countries. Instead of bringing solutions, we should focus on supporting the evolution of local solutions mixed with a seasoning of what we call universal human rights. The local value system is a major reason why solutions to market systems development have to be context specific. They add to the complexity of the situation. The interrelation between actor relations and the values those actors hold are key characteristics of the complex adaptive systems of human society. Intervening in these systems is no simple trick. Complexity theory can help us to achieve significant and systemic change that will benefit a large number of people. Have you ever considered looking into design thinking as an approach to dealing with complexity? I really like the perspective as Larry Keeley has portrayed it in the design venn diagram (http://valuechaingeneration.files.wordpress.com/2011/12/venn_diagram.jpg). Integrating technology, human values, and a fitting business model lowers the barriers for users to adopt a product or service. That is what creates opportunities to scale. In my opinion the development sector spends way too little time for time to figure things out, in terms of what problem they attempt to solve for their target audience. Also in terms of implementing solutions, too little is prototyped, using iterations of possible solutions to figure out what works and how to refine. If you don’t have that flexibility built into project management, then complexity becomes a load that is too heavy to carry. 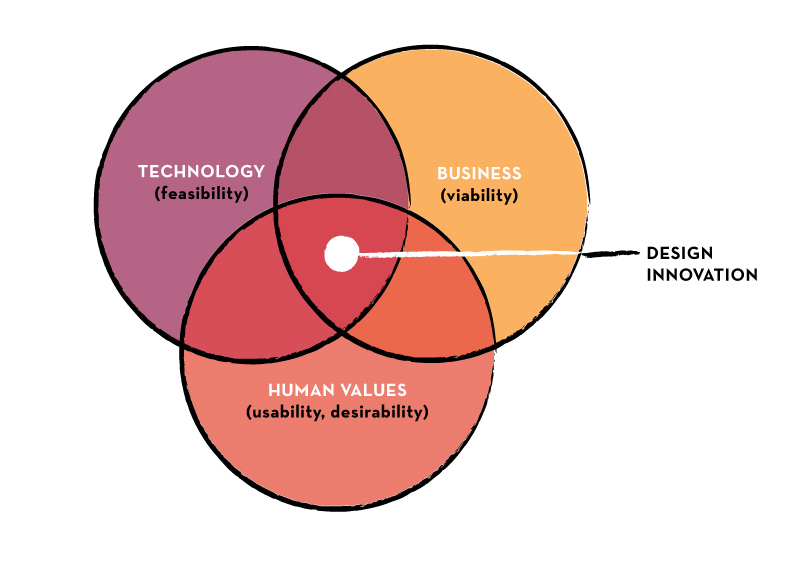 Chances of finding the optimal innovation sweet spot within the venn diagram will become very slim. I hope you can share some insights on the relation between design thinking and complexity and what it might mean for development. I’d be very keen to have them! Thank you for your comment. I must admit that I am not familiar with design thinking. I will have to dive into it a little bit more in order to give you an educated reply to your request to connect it to complexity. A first thought – that might not do the approach any justice – is that I see a danger in believing in solutions that were ‘designed’ as a contrast to solutions that ‘evolved’ in the respective context. The notion of design has something ‘external’. Further, I guess that if you design a solution, you need to have a pretty clear goal in mind, a target state for the system. I am still musing about our ability to anticipate such a target or to say it differently our ability to anticipate what is best for the system. In this regard, see my last two articles (here and here). As I said, this might not do the design thinking approach any justice but I’d be interested to hear your take on it. Thanks for your response, I’ll definitely have a look at your suggested readings! Regarding your concern on design being external I can tell you that design done properly is not. The design process takes the end-users intents, actions, and expectations into consideration to optimize for adoption. It does this through an iterative process of obtaining feedback on the designer’s anticipation as quickly as possible, rather than leave anticipations untested in real world decision making. Let me know if you’ve let some thoughts move over the concept of design thinking. Hope to be in touch! I am working a lot in an engineering environment. From this experience I have found that many design engineers think of systems in a protected and predictable way. Of course they recognise external influences, but they still see the past behaviours as a way to predict the future. A lot of complexity work tells us that the past tells us little about the future. Thank you for stretching us continuously with your thinking, and for sharing your developing thoughts with us (not keeping it secret until you have figured it out). Firstly, I suspect a lot of practitioners confuse systemic with systematic. Systematic meaning getting a representative sample involved, making sure no one important or marginalized is excluded. Some even see systemic as being rigorous, meaning making sure that sufficient evidence is selected, etc. The problem with a systematic approach is that it is not resilient,and because of the detail it often excludes a lot of the stakeholders in the system from both the collection of facts, analysis of trends and the design of interventions. This is one of the reasons why I like participatory methods as it allows the stakeholders to reach the insight with or even before the facilitator sees it. It supports the system to understand the system better. Another point is about the value you describe as economic systems being about wealth creation. I agree with this fully. Even when entrepreneurs cannot express it, or due to culture would rather not express wealth creation as their ultimate objective, it is there and visible in their behavior. I am always impressed with how even the poor can make investment decisions that balance short and long term factors. But a wealth creation value of a system can be at odds with a poverty reduction value of a donor. For instance, when a pro-poor strategy is implemented, practitioners should not be surprised if people express support, but then not follow up with their own contributions. My opinion is that pro-poor is in most cases unsystemic. Lastly, the way development programmes measure pro-poor means that the focus is on individuals or target groups, and not on institutions that support economic systems. An acknowledged difference between poor and not-so-poor countries is range of economic and social institutions that supports the economy and the society. I think that for development programmes to be more systemic, they should work on assisting societies to develop the appropriate institutions, thus move away from directly measuring progress at micro level. An example here from South Africa relates to the very poor and expensive transport infrastructure that the poor is dependent on to get to urban centres from rural and semi rural areas. There are countless projects aimed at helping the poor start businesses near their homes, helping the poor to run vegetable gardens, all clustered under “economic development”. However, the government strategy to get the poor to work is completely lacking, in fact most of the public investment into transport is going to the wealthier groups. People searching for jobs, or that travel to jobs have to sometimes travel for 3 hours in 1 direction. For a day worker to travel to and back to work could easily cost as much as 30 to 50% of the day wage. So a systemic intervention should focus on making the physical system work better (this is a complicated problem, not a complex one) in order to make the social system work better.